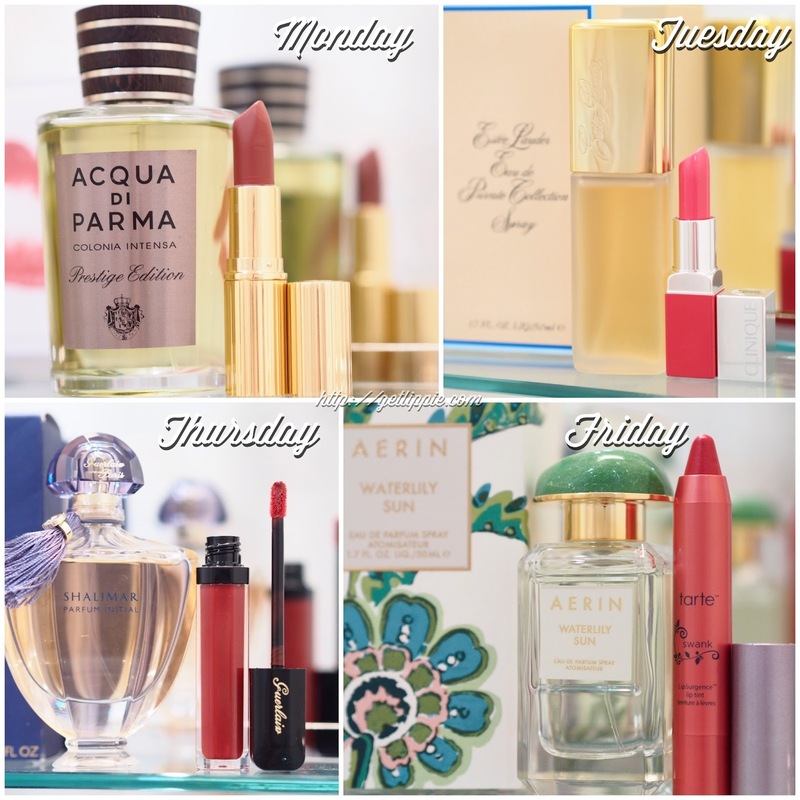 I was ill on Wednesday, and yesterday (the day after the Paris terrorist attacks), rightly or wrongly, it simply didn’t feel appropriate to celebrate lipstick and perfume on Instagram, so a shortened #LipsNspritz this week. Monday brought Charlotte Tilbury Matte Revolution lipstick in Walk of Shame wjhich is a lovely neutral berried-rose shade (seriously difficult to describe this one, it’s not red, and it’s not brown) which is one of my favourites for looking polished without drawing attention to itself. Inspired by the name, I wore it with Acqua di Parma Colonia Intensa, which is Aqua di Parma‘s hairy-chested big brother, fresh from a hot shower, and about to put on his medallion and dancing shoes. The smell of hot soap, shaving cream, and chest hair, it’s about as masculine as it is possible to be. On Tuesday, I went to the opposite extreme, pairing Estee Lauder Private Collection – the smell of bitter, green boardrooms, shoulder pads, and perfect manicures – with Clinique Color Pop in Kiss Pop. I liked the idea of pairing the mature femininity of Private Collection with a bubblegum confection of a lipstick. Thursday brought what is likely to be one of at least five appearances for Guerlain Shalimar in one guise or another. Seriously, for a fragrance I don’t, in all honestly actually like that much, I sure do own a lot of bottles of it! This time around I wore it’s perfect entry-point fragrance: Guerlain Shalimar Parfum Initial, which as it has the addition of a lot of buttery, carroty, rooty iris in the opening is much easier to wear than the tar, fur and vanilla of “grown-up” Shalimar. I wore it with red lips, regardless, breaking out the Guerlain Gloss d’Enfer in Rouge Parade, which was last year’s Christmas lipgloss from Guerlain, and I like it very much indeed. And finally, because I had a day off on Friday, and was just wandering around a very wet and windy North London (because: reasons), I wore simple and yet still lovely Aerin Waterlily Sun. Which is an aquatic floral – an unknowingly apt choice, considering the bright sunshine I applied it in first thing Friday morning! It’s very lovely, and it’s something I wear quite regularly when I just want to smell pretty and simple. I paired it with Tarte Lipsurgence Lip Stain in Swank, which is a sheer and pretty red colour. The Fine Print: PR Samples and purchases.